AUSTIN, Texas — Kelly Gall would prefer if you didn't know her name. But the fire specialist with the Austin Fire Department is now stepping into the spotlight for her first interview. Gall's story started July of 2017 at Fire Station One on Fifth Street in Downtown Austin. That's where she worked with James Baker, her supervisor and good friend of 10 years. That's also when she just told him she was temporarily leaving Station One for a few months to serve as a team leader at the Fire Academy. "Ever since he heard I wanted to do it, he was very disgusted and angry that I would be leaving the station," Gall said. "I tried to say it's only temporary." During that time, he sent a number of strange messages: A picture of himself alone on a couch with the caption, "Here are my shifts now," and another that read, "Miss you so much." To appease her friend, Gall volunteered to work at Fire Station One on Labor Day -- the same day Baker recorded her. Gall said this gave him plenty of time to plan the crime. "He had time to go get the spy cam, he had over three months to choose between doing something right or wrong, and he opted for the wrong," Gall explained. Gall remembered Sept. 3 well. She had just finished a call and returned to the station when she saw Baker walk out of the women's locker room with soap in his hand. "And I was puzzled and I said, 'What are you doing with that soap,'" she said. "It was department-issued soap, and most people bring soap from home, and he said, 'I like to use it to wash my feet, it makes a really good lather,' and it was just really odd and awkward conversation." She went in and took a shower. When she came out, she noticed something in the shelves. "And I was drying myself off, and we had quite a bit of stuff on the shelves in the bathroom, and I just happen to remember looking up at the Christmas lights and remember seeing something blue and I thought, 'Wow, what is that? We use clear Christmas lights, what is that blue light?'" Gall said. A Google search confirmed Gall's worst fear. It was a spy camera. As she sat and processed what she just learned, Baker walked up and asked to talk. "At that time, admitted that the camera was his, apologized, 'I'm so sorry, I care about you so much, I'm sorry, I'm sorry.' I didn't know what to say, so I just let him talk," she explained. "I'm thinking yuck, I'm thinking creepy, I'm thinking gross, I'm thinking that I looked to you like a family member and you're doing this to me ... He told me he'll transfer stations, he told me that he'll retire," she said. Baker told her as much in a series of text messages the next day. First, he asked, "I'm in trouble now?" Also telling her that "APD came to the station." Pleading with Gall to "please let him know." Writing "If I don't hear from you, then I know I'm done!!" The last message reads, "I just told [my wife] ... I know you can't talk about it to me. I will be retiring tomorrow." "I've got a lot of regrets. I'm mad at myself because I didn't see this coming," said Gall. But Gall said what is even worse than the crime is that the criminal justice system failed her. "I think dealing with the criminal side was almost worse than dealing with the incident itself ... We are so confused," she said. "You've got the video recording of him committing the crime, he's confessing to the crime, I never understood, why wouldn't we take it to trial?" Instead, Baker reached an agreement with prosecutors. He pleaded guilty in exchange for five years deferred probation. No jail time. He also retired from the Austin Fire Department. And that just doesn't sit well with Lonnie Gall, Kelly's husband. "What happens in another case where the bad guy isn't crazy enough to video himself on camera or instead of confessing, denies it," he said. "If you can't get a conviction with that much evidence, then what happens with the next case?" We asked her if the city failed in 2013. "It absolutely failed," she replied. "No doubt about it." Bob Nicks is the president of the Austin Fire Association. He said this would have never happened to Gall if the City would have taken action in 2013, when several firefighters accused Baker of groping female patients. "There was not a real investigation done," said Nicks. "There was a clinical investigation to see if he knew how to do assessments correctly but they never took the investigation seriously. Actually, some reported to me that they felt retaliated against when they tried to press it further and nothing was done about it." In November, Gall filed a civil suit against the City of Austin. She said AFD higher-ups should have known better and should have done more to prevent Baker's sexual harassment against her, which is why the 16-year veteran hopes her actions now will help others in the future. "If this terrible incident that happened can bring some good, I'm all for that," she said. We asked the Travis County District Attorney's Office for an on-camera interview. They declined and instead sent a statement. It reads in part, "by entering into this agreement instead of risking trial, the District Attorney gained the advantage of the assured finding of guilt, the imposition of the maximum amount of community supervision, and the surrender of his licensing. 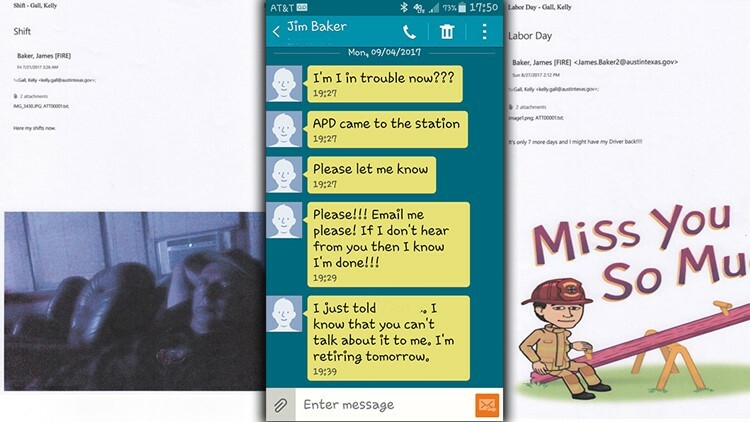 Mr. Baker will no longer be a firefighter or EMT." The victim was consulted before the plea offer was made. We fully understand that the victim is not happy about the plea offer in this case, but our efforts to satisfy her demands had to be balanced against our legal and ethical responsibility to see that justice is done.